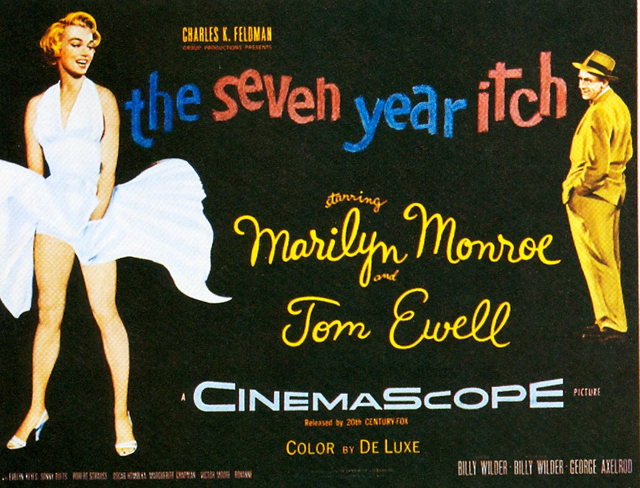 As I recently discussed on GlamAmor, little in film has made a bigger impact on fashion than 1955's The Seven Year Itch. Marilyn Monroe flaunts her figure in several incredible dresses thanks to Twentieth Century-Fox costume designer William Travilla, but the movie is a Style Essential due to the one dress that exploded in our cultural consciousness. Everyone knows the iconic white halter dress that flutters up around Marilyn's waist when the subway breeze blows beneath her. Since that moment, there has been a steady supply of options to help women channel their inner Marilyn. This, of course, ranges from costume copies to contemporary clothing. Its influence even in high fashion is hard to ignore. The little white dress is a wardrobe staple and there are precious few that don't take at least some inspiration from Travilla's design for Marilyn. The halter top, wide waist band, self tie belt, pleating, and swingy skirt are details that have continued to appear in dress after dress after dress. Nearly every one of the fashion houses--whether more minimal like Calvin Klein and Donna Karan or more over-the-top like Betsy Johnson and Versace--have all done their own versions. And now up and coming designers like Rafael Cemmano and David Jones continue to do beautiful interpretations, some of which you will see below. 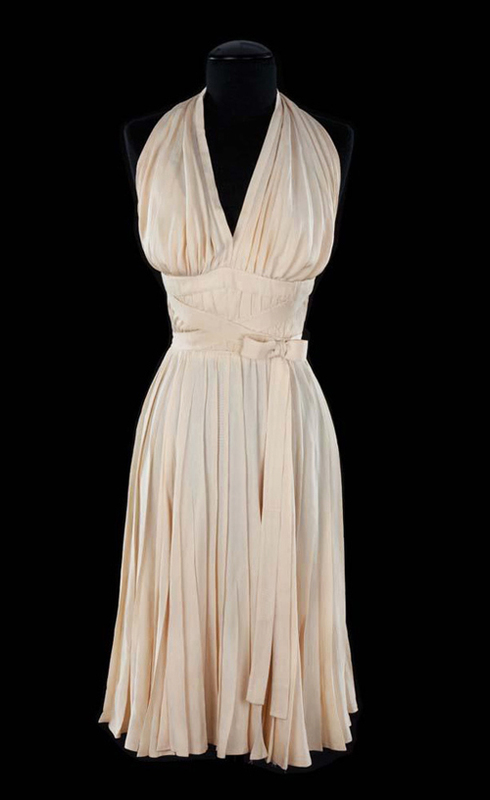 This dress is so iconic that its moment on film has been immortalized in countless ways. 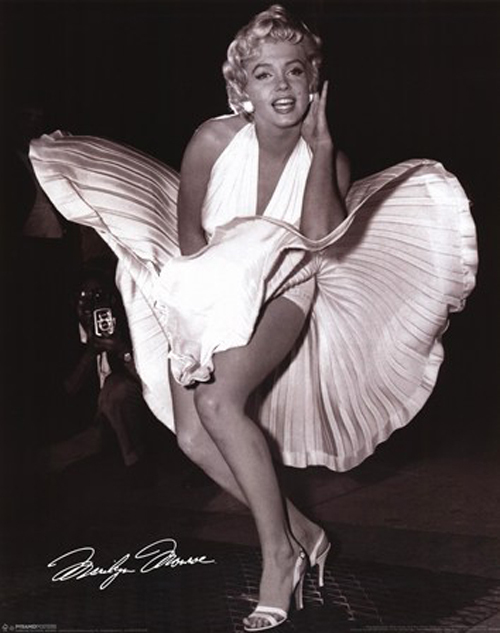 Almost 60 years since it first appeared in Seven Year Itch, it still appears everywhere...from cards, t-shirts, and posters to plays, television shows, and other movies. There is even a 26 foot statue by artist Seward Johnson of Marilyn in all her glory standing in Chicago today. But its influence truly lives on in fashion and here's where it all started...just a simple summery little white dress. Oh, I'm so glad you liked it, Kay! There are so many examples of dresses that I confined myself to sharing more recent ones. It's quite simply a dress that keeps influencing fashion. I didn't even get into all the colors it appears in as well...I actually had a purple version when I was growing up! Love Marilyn's look. She had an amazing smile! And I agree about Marilyn's smile. I know she has many positive attributes and assets, but her smile is a huge reason she comes across so wonderfully on film.